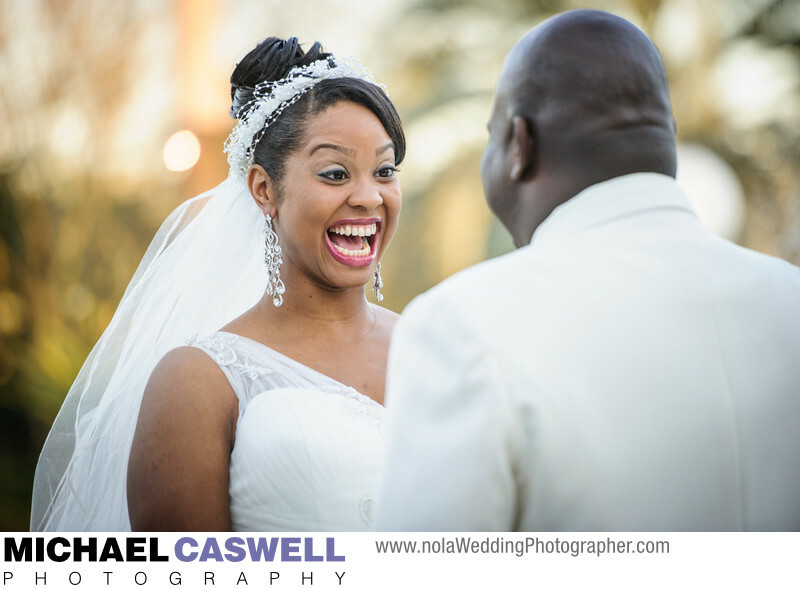 Bathed in soft and beautiful late afternoon light at Southern Oaks Plantation in New Orleans Louisiana, this happy bride can't suppress her joy as she looks into her groom's eyes during their first look prior to their wedding ceremony on this pleasant Spring day. This first glance took place behind Southern Oaks in the pool and garden area, which is a great spot for this, especially late in the day when the light is best. These kinds of images are exactly why I love photographing first looks, as they often result in beautiful and genuine reactions such as this, which usually cannot be duplicated on demand in a regular portrait session.